Foursquare has released an update to their Swarm for Windows Phone app with a wide range of updates and improvements to the app. 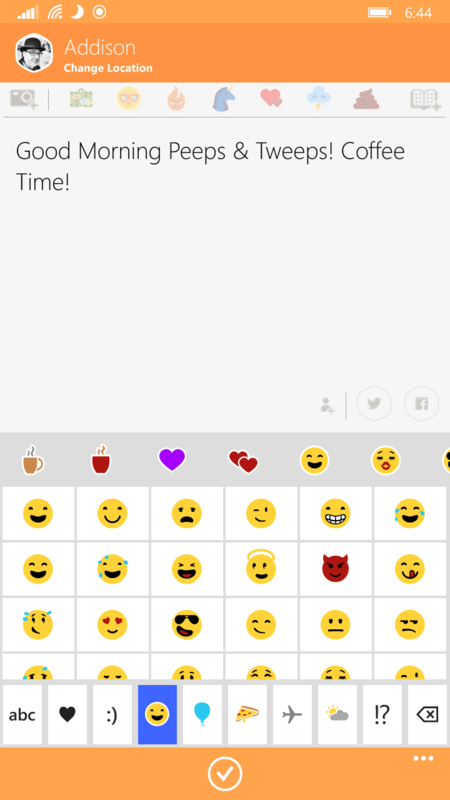 The headline improvement is that Swarm now has a Emoji keyboard which can be used for shouts, plans and check-in along with plan comments. The update is listed as version 1.3 and is available now in the Windows Phone store. If by chance you are not familiar with Swarm, this is the new check-in app from Foursquare that was released back in the early summer. Foursquare the app has turned into more of a location discovery app (which is quite good by-the-way) while Swarm has taken over as the check-in app. can now view all of your active leaderboards (sticker and category) from within your profile and along with that, sticker image loading times have been improved. Also, you can now cancel pending friend requests that you have sent to other Swarm users. Finally there is the popular “performance improvement and bug fixes” for the under-the-hood changes to the app. In checking out the updated app this morning, it does seems that overall it is a bit snappier than before the update but I have nothing scientific to prove that out. Swarm for Windows Phone is free but does require that you have a Foursquare account.